I understood what he was saying, but I was skeptical. The house we were buying was infamous for its previous owners who had poured fuel oil on the hedge between their house and the next. Although it was technically on the adjoining property, they didn’t like a hedge nor did they want to discuss the problem. The ground took years to recover. What if we had been neighbors to them? Many people enjoy nice neighbors. Ours turned out to be far more. At the time, we were embroiled in a protracted, ugly struggle for custody of our children. The fact that their birth mother was registered with the state for her abusiveness didn’t seem to matter. The domestic courts had seen and heard too much from too many divided parents until the stories had begun to blend into a nasty roar. The judges were reluctant to be definitive. Each time we went to court, the presiding judge would warn the birth mother if she didn’t mend her ways, she would be looking at jail time at our next appearance. When the next time came and nothing had improved, we would have a new judge, and the scene would be repeated verbatim. The children suffered the same despair we suffered. Like the Holocaust father in the Italian film LIFE IS BEAUTIFUL, we worked hard to distract ourselves from a nightmare that never seemed to end. One New York publishing agent told me that the story of our struggle for custody is too common to be interesting. We all grow weary of hearing more tales of abuse and anger and frustration. Thus, in our “worst of times” my husband and I found ourselves in a position where the people who loved us best–our friends, families, and religious leaders–had little comfort to offer. When you’re buried beneath gigantic sharp-edged rocks, hearing someone who has no such burden tell you “don’t worry; it’ll all work out” is not reassuring. I’m sure we were dreary company as we searched desperately for someone who could help us cope. People found reasons not to spend extended time with us. One day, we attended a church service recommended by our neighbors, and although all four of us in our family were sobbing audibly through a rendition of “You’ve Got a Friend” because our family was about to be torn asunder by the courts once again, not one person from the huge congregation asked if we were okay. Through all of this and more, we had one solid, unfailing source of support–Eddie and Maribell. They sat and listened as we ranted about the unfairness of life. They watched the children as we traveled to court appearance after court appearance. They used gentle humor to coax us into scraping together more resilience. They constructed handmade gifts for us that I treasure to this day. Recently, Eddie died. Maribell is distraught. We haven’t lived near one another for many years, but the world feels lonelier. We’re anxious to find a time when we can travel to lend our love in person. Eddie and Maribell stepped in where our own parents couldn’t go. They stood in for the friends we had chosen so carefully. They avoided the platitudes and fantasies others offered. They warned us when our children were acting out their rage. We’ve had many good neighbors since we moved away, but none are as revered in our hearts as Eddie and Maribell. When we’re able to reach out to the people who live near us, our neighbors have Eddie and Maribell to thank. “Love thy neighbor” is no trick when your neighbor loves you first. I love them better than I love myself. 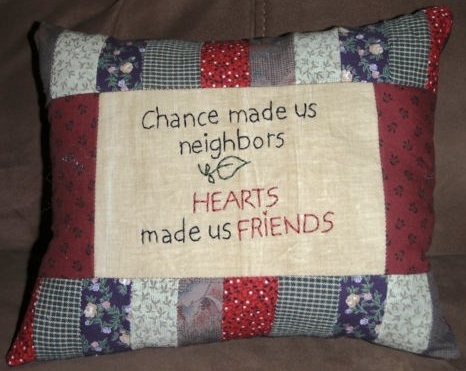 This entry was posted on March 23, 2014 by Personal Journeys with Gramma in Life Stories and tagged Comraderie, Custody Battle, Divorce, Faith, featured, Friends, Friendship, Hope, Life is Beautiful, Life Stories, Love, Neighbors, Support, Support System, Trust, You've Got a Friend.